What is the motive behind the Titan Shifters' actions? Okay, so I read a bit of the manga, and I know a good amount of spoilers. But why are most of the titan-shifters trying to destroy humanity? Eren and Ymir are good, right? Why do some titan-shifters want to destroy humanity, and what are Annie's, the Colossal Titan's, and the Armored Titan's backstories and motives? Since there isn't much revealed in the manga, this answer is going to be a speculative one. It's known that the royal family has been trying to wipe out the titans. They prepare someone to become the "Carrier" of the Coordinate, but each time a new titan gets the power, they accede to the demands of the 1st king, that is to allow the titans to dominate human, i.e. Titan rule. The primary motive of the Titan Shifters is to recover the Coordinate, unknown to the fact that only someone from the royal family can use it's powers optimally. The ape titan, is somehow related to the royal family and wants to fulfill the 1st king's wish. Or, he just wants to convert all humans to titans, thus creating an only titan nation and annihilating humanity. I thought I would update this question with information leading up to, and including, Chapter 94 of the Attack on Titan manga. I realize that these questions are broad, and the answer will be long, but it’s worth having it all in a single place. Warning, severe spoilers take place in the answer below. I have done my best to indicate where the spoilers come from, but read at your own risk. Why are the titan shifters trying to destroy humanity? What are Ymir's, Annie's, Bertholdt's, Reiner's and Eren's backstories and motives? A great deal of the story up until Chapter 86 had occurred on the Island of Paradis, within the three concentric walls - Maria, Rose, and Sina - all located in the region circled in red. Then, in Volume 21, Chapter 86, page 163, we are visually made aware of the mainland which is the landmass referenced by the blue arrow. This landmass belongs to the Marleyan government. Finally, in Chapter 93, we are made of aware of another presence, the region now known as the Mid-East Allies which is indicated in pink. 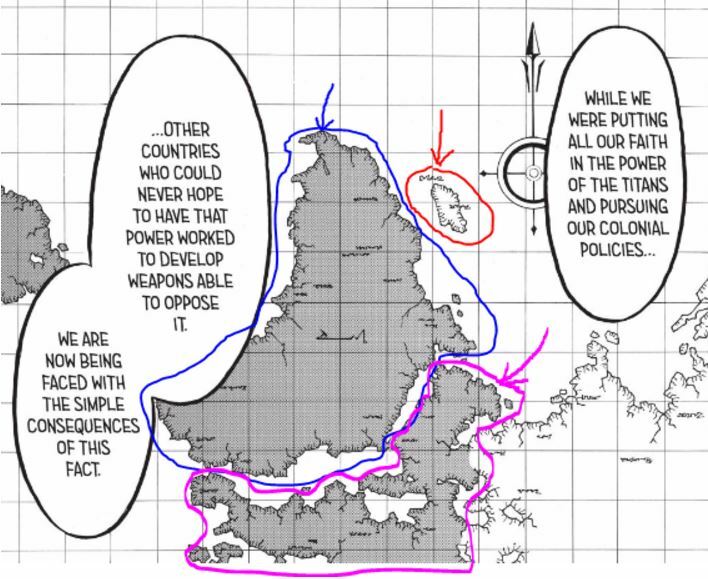 There are other regions that we can see from this map, but they have not been discussed so far in the manga. Keep all of this in mind as we move forward because the political events get a little messy. 1,820 years ago, the Eldians' ancestor Ymir Fritz made a contract with the earth devil in exchange for the power of the titans. When Ymir died, her soul was split nine ways into nine separate titans. Using the power of the titans, Eldia conquered the nation of Marley, and started a phase described by the Marleyan government as an ethnic cleansing that lasted 1,700 years. But, the previously conquered nation of Marley was able to bring 7 of the 9 titans under their control, thus leading them to victory in the Great Titan War against Eldia. King Fritz escaped to the Island of Paradis, built the three walls - Maria, Rose, and Sina - and took refuge there with some of his people. Unfortunately, not all Eldians escaped with King Fritz and some were left behind; they lived in the internment zone for Eldians on the mainland. a penal colony implemented by the Marleyans. In fact, the mindless titans are created at the border of the Island of Paradis by the Marleyan government through injecting the titan serum into the neck of Marleyan traitors (Eldians from the internment zone). This is done not only to punish the traitors by sentencing them to a life as a mindless titan but to keep the remaining Eldians trapped within their three concentric walls, using the newly created mindless titans as a source of cheap military labor that keeps the Eldians caged in. Confirms a biological difference between the Marleys and the Eldians. That is to say, only the Eldians, or the subjects of Ymir, are capable of turning into titans. It is through this conversation that we learn that the Marleyans protect themselves proactively by segregating and oppressing the Eldians. the original titan, Ymir Fritz, had implemented the titans to cultivate land, establish roads, construct bridges, etc. for the benefit of humanity. that the Eldians were at fault as well in the historical conflict. They used the mindless titans as a means of warfare and not simply for the benefit of humanity. The OWL confirms the many theories of the Eldian/Marleyan history and conflict, but in the end, the only amount of truth is in their reality. The Marleyans require resources in the form of titan power (Chapter 92, Page 47) and fossil fuels found on the Island of Paradis, home of the Eldians. The first attempt to re-take Island Paradis was for natural resources, and the second attempt to re-take Island Paradis will be because the Marleyans almost lost in battle to the Mid-East allies and they need a show of force in the form of reunification of all titans under the Marleyan banner. However, because the Marleyans deployed so many mindless titans as a means of originally securing the penal colony (Island of Paradis) they now have to deal with those mindless titans before they can secure the needed resources and titan power. And, the only way to do that is to find the founding titan, so that they have a viable means of controlling the mindless titans. Thus, they sent their arsenal of titan-shifters into the penal colony in an effort to secure the founding titan and the co-ordinate. Okay, so we’ve got all that background story out of the way, let’s talk about the titan-shifters and their backstories, allegiances, and motives. Some will be shorter than others and this is because there’s very little remarkable information about their backstory, motives, and allegiances. Ymir was once an Eldian beggar child who lived on the mainland under Marley rule. She was adopted by cultists, proclaiming that she was Ymir Fritz, and she was worshipped in secret by this cult for quite some time. She went along with this role for the cultists in an effort to please them. Eventually, however, the Marleyan government caught on to the cult, which was performing illegal activities in the worship of Ymir Fritz, and Ymir took on their punishment for them. She was sent to the Island of Paradis, sat along the edge of the wall, injected with the titan serum, and thrown down into titan territory to suffer her punishment as a mindless titan. Ymir had spent 60 years as a mindless titan after she had been injected with the titan serum. 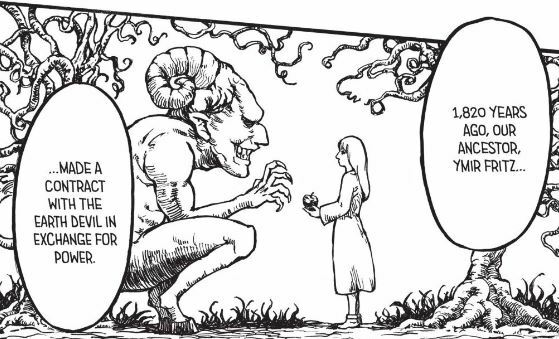 It was revealed prior to this chapter, and later confirmed in subsequent chapters that after some time, she hibernated under brush and dirt until, in the year 845, Marcel Galliard, Reiner Braun, and Bertholdt Hoover were on their way to infiltrate Wall Maria and they happened to cross paths with Ymir. 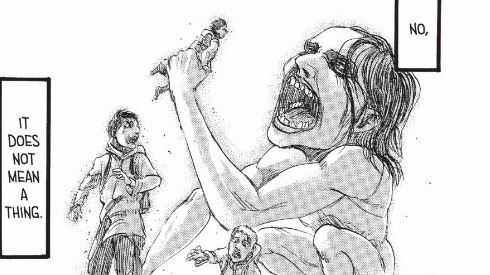 She sprung out at Reiner, and Marcel pushed Reiner out of the way in an effort to save him, but was eaten by Ymir in her mindless titan form. Marcel, the Jaws titan-shifter, thus passed on his abilities to Ymir and she became the Jaws titan-shifter. However, she did not join forces with Reiner and Bertholdt. Instead, she re-joined civilization where she met Krista (Historia Reiss) whom she became romantically interested in, and remained by her side until later events. In the Survey Corps battle to get Eren back from Reiner, Ymir chose to let Krista go back to the Survey Corps and parted with Krista to save Reiner and Bertholdt. We don’t see her again in the story until much later. Porco Galliard, the brother of Marcel - the titan-shifter Ymir had consumed - stated that he had not yet been able to see his brother’s memories but was able to learn a lot about Ymir after he had consumed her, even going as far as insulting her. Krista all the way until death. Although Ymir was an Eldian, she did not side with either the Eldians or the Marleyans. Annie Leonheart. Annie is an Eldian and was raised in the Eldian internment zone on the mainland occupied by the Marleyan government. 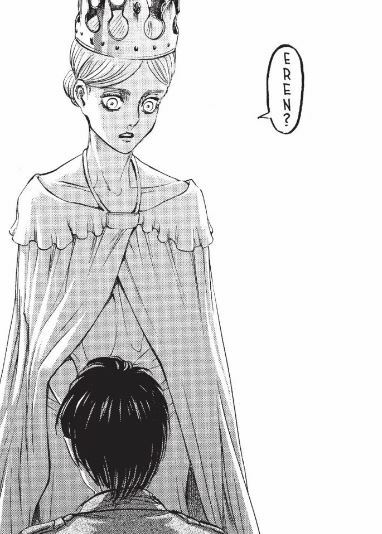 She enlisted in training and demonstrated great fighting skills and was selected by the Marleyan government to receive the power of the Female titan. She was part of the operation in 845 to infiltrate Wall Maria with Reiner, Marcel, and Bertholdt and they were all her comrades from training. When she successfully infiltrated Wall Maria, she joined the 104th Training Corps. 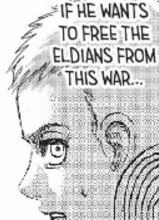 Her allegiance is to the Marleyan government but with the help of the Attack Titan, she was captured by the Eldians on the Island of Paradis and we haven’t heard anything solid about her since. Bertholdt Hoover. Not a lot of backstory for him. He grew up in the Eldian internment zone in Marley. He enlisted in the training program to be selected for a titan power and received the power of the Colossus Titan. Up until his death, his allegiance was to the Marleyan government. Reiner Braun, an Eldian raised in the internment zone within the nation of Marley. Reiner, like Annie, Marcel, and Bertholdt, trained to be selected for a titan power and he was selected to receive the Armored Titan. The Marleyan government sent Reiner to infiltrate Wall Maria in 845. However, after remaining undercover in the 104th Training Corps, he displayed some residual psychological effects that caused him to forget he was working for the Marleyan government and he had to be reminded on a few occasions, by Bertholdt Hoover, of the true nature of his mission. 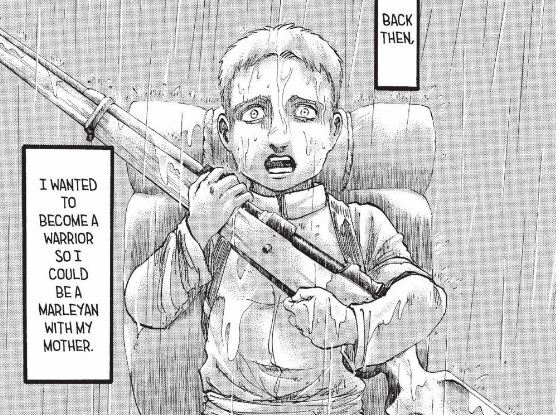 After losing Marcel in 845, and being prevented by Zeke from saving Annie from the Eldians on the Island of Paradis, and incapable of saving Bertholdt when he was consumed by another mindless titan (the next Colossus Titan), we see that Reiner suffers from grief and the loss of his friends when he pictures them as he’s talking to a group of younger recruits. a group of normal people, different than Reiner, Bertholdt, and Annie, each with their own strengths and flaws that were seen in an entirely positive light as he recalls the events. 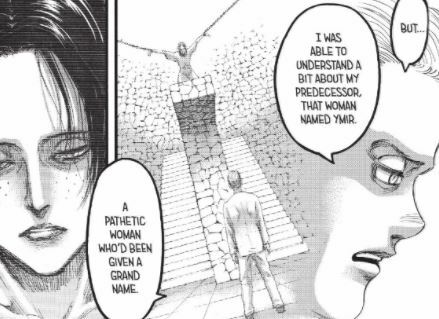 This perspective confuses the family, and the family immediately covers up after Reiner, portraying everyone on the Island of Paradis as monsters that built an empire off corpses. But his perspective of his enemies at the dinner table calls Reiner’s allegiance into question. That being said, his current allegiance is to the Marleyan government. His only reason for enlisting as an Eldian in the Marleyan military was so that his mother and father, one a Marleyan and the other an Eldian, could be together again. But the relationship was forbidden, and being an honorary Marleyan through selection for a titan power would allow his family to be together. The Survey Corps, and after the re-taking of the Island, the Survey Corps & the kingdom under Historia Reiss. His mother was devoured by a mindless titan in the very beginning of the story and ever since he's been out for revenge. More recently, his understanding through memories has altered his perspective a bit, but it has yet to change his allegiance. We will have to get further into the story to see if events change his loyalty to Historia Reiss and the Survey Corps. Due to the existing feud between the Marleyans and Eldians, established 1,700 years ago. The first attempt to take the Island of Paradis by the Marleyans was to secure the natural resources on the Island. The second attempt to take the Island of Paradis will be for the unification of titan power under the Marleyan government. Please note: I will update this answer as things change. I heard a theory that Annie, Riener, and Bertoldt were trying to free the Titan Shifters inside Wall Maria, possibly other shifters from their homeland. 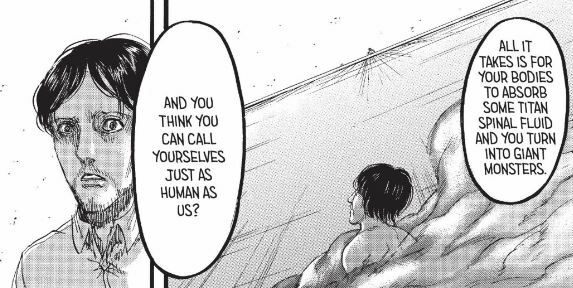 Also this would explain how surprised Riener was when Eren flipped out and attacked them when it was revealed they were also Titans, and thought it'd be okay for Eren to come with them. They may have known what the government wanted to do with a Titan Shifter's power. For example, switching Eren's coordinate power to another Titan. So, they were saving the shifters from the people. All of us know who are the titan shifters, which are Eren, Reiner, Bertoldt, Annie, and Ymir. 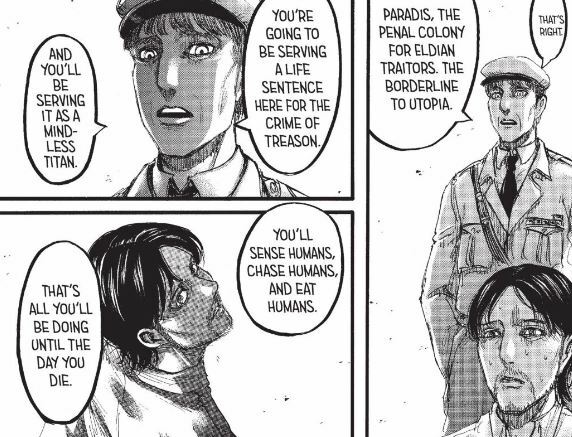 We already know what is Eren movtiation is saving humanity, have a taste of the outside world and having his revenge on th titans after what happen to his mother. Annie her movtiation was getting Eren and take him back to Reiner and Bertoldt. Reiner and Berholdt are emotionally and physically damage because they saw their friend get eaten. 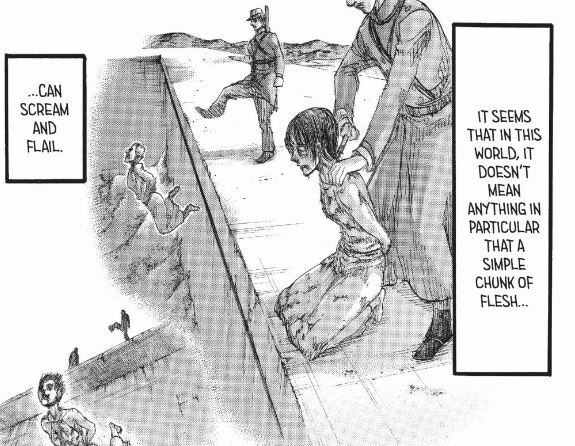 If Reiner and Bertoldt wanted to free the people they shouldn't break the walls because 20% percent of the population died in Wall Maria it has to be something else. I was doing research it said they destory the walls to get Eren but they failed many times because it said that Eren is the coordinater but I don't know their true motivation on destoring the walls. 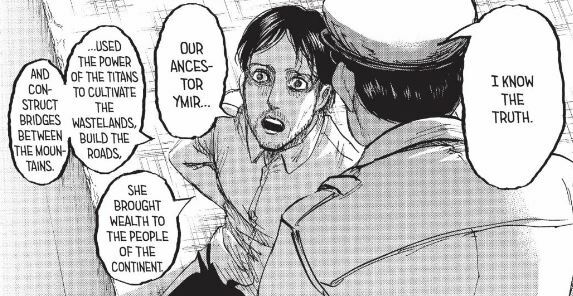 Also they want to know what is in the basment that Eren's dad was hiding. I dont spoil this for the fans of Attack on Titan because I am a fan too. I hope this help a little. Was the Scouting Legion's patch or the character's Military affiliation changed? What exactly happens to a Titan's body after it is killed? Why is Bertolt's Titan form so much bigger than the other Titan Shifters? 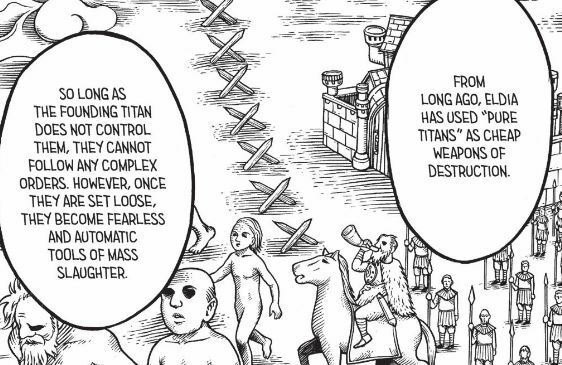 Why the Survey Corps doesn't find a human body inside each titan? In Attack on Titan, why does Zeke tell Eren that someday he will save him? Who was the other person the colossal titan ate? Why didn't Eren Yeager saw the Key before in Attack on Titans?